Cleveland High School students and alumni will gather on Saturday, June 29, at 11 a.m. for a ceremony officially dedicating the school’s library to the late Edward Landon, who spent his entire career (1948-1973) teaching history and coaching football, basketball and baseball at Cleveland. Landon’s 4-year-old great-grandson, Dilon Hagedorn, will unveil the plaque honoring his great-grandfather, who died on January 15, 2013, aged 98. The event will take place at 11 a.m. on the second floor of the main building. Landon, a World War II veteran and former minor-league pitcher, was known by the nickname “Mr. Cleveland” for his dedication to his students. He wrote the first Seattle Public Schools curriculum on African-American history, as part of which he invited members of Seattle’s Black Panthers to sit in on his history lectures and provide feedback. Landon was previously honored by a scholarship fund in his name, managed by the school’s alumni association. Donations may be sent to Ed Landon Scholarship Fund, Cleveland High School Alumni Association, PO Box 94004, Seattle, WA 98124-9404. 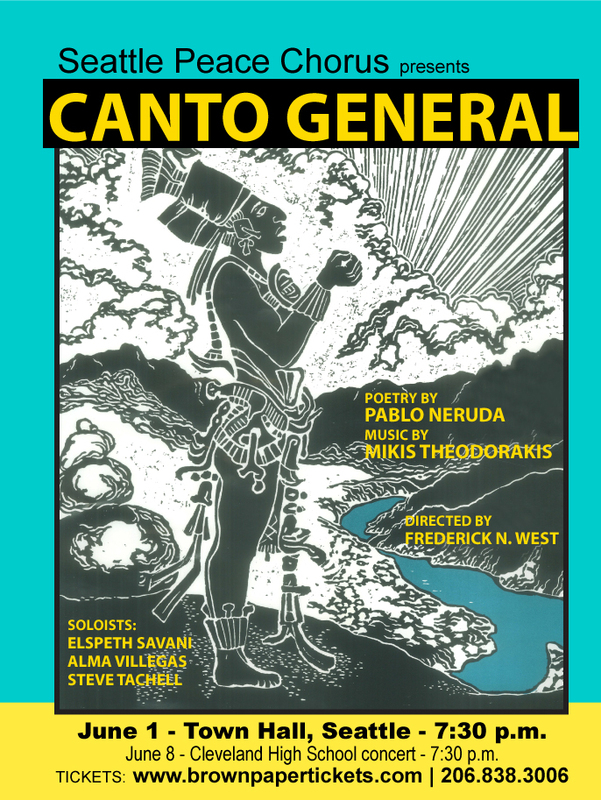 The Seattle Peace Chorus will perform “Canto@Cleveland,” featuring the Canto General by Nobel Laureate Pablo Neruda and renowned Greek composer Mikis Teodorakis, at Cleveland High School (5511 15th Ave. S.) on Saturday, June 8, at 7:30 p.m. The event will also include a poetry reading by a Chilean Mapuche poet accompanied by an Andean pipe player. The chorus does not normally perform at high schools, but chose Cleveland for one of their two performances of Canto General due to the school’s renovated auditorium and location in a diverse vibrant neighborhood. One hundred free tickets are available through the school for Cleveland students. Other student tickets are $5 and tickets for Cleveland parents are $10. These are available at Cleveland on the night of the concert. Advance tickets for others are $20 ($18 for students, seniors, and disabled) and can be purchased from a Seattle Peace Chorus member, online through Brown Paper Tickets, or by calling 800-838-3006. Adult tickets for $25 can be purchased at the door. Proceeds from tickets and a free-will collection at the concert will benefit the Cleveland High School music program. Advance tickets for either concert are $20 and $18 for seniors. They can be purchased from a Seattle Peace Chorus member or at www.brownpapertickets.com or by calling 800-838-3006. Adult tickets for $25 can be purchased at the door at either concert. 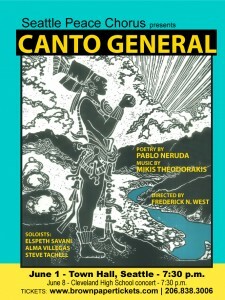 The Seattle Peace Chorus will also perform the Canto General at Town Hall (1119 8th Ave) on Saturday, June 1 at 7:30 p.m. This show will also benefit Cleveland’s music program. As with the Cleveland show, advance tickets may be purchased from a Seattle Peace Chorus member, online through Brown Paper Tickets, or by calling 800-838-3006. 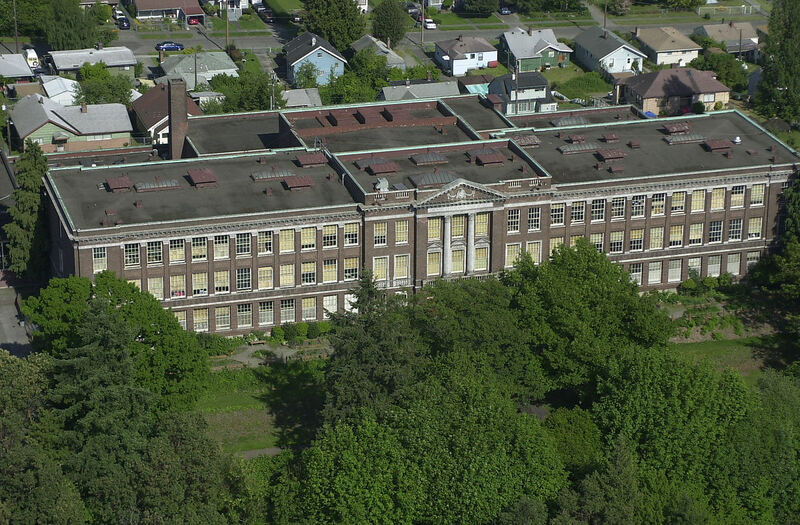 Here on Beacon Hill we have the only STEM high school in the region: Cleveland High School, an option school open to all students in Seattle Schools. Cleveland STEM will host school tours later this month and in early March, as well as hosting an open house on February 27 for prospective students and parents. The school tours are on Thursday, February 21 and Wednesday, February 27 from 8:15 to 10:15 a.m. The open house is Wednesday, February 27, from 6:30 to 8:30 p.m. Space is limited, so please RSVP with your phone number and preferred dates to registrar Kelly Tagupa at katagupa@seattleschools.org or 206-252-7814. STEM stands for “science, technology, engineering, and mathematics,” and Cleveland’s STEM program focuses on those fields through two academies, the School of Life Sciences and the School of Engineering and Design. Students in the STEM program take four years of math and science, with the opportunity to take AP courses. Find out more about the program at the website. This video, STEM Pays, is an introduction to Cleveland’s STEM program and the careers STEM students prepare for. Cleveland High School “Beacon Hill’s best building”? The Stranger’s Charles Mudede suggests that Cleveland High School (the new portion) is “Beacon Hill’s best building.” The new addition, designed by Mahlum (see a slideshow of the building here), was an AIA Project of the Month in May, 2010*. It also won a Citation Award in 2008 from the American Association of School Administrators. Do you agree? What do you think is the best building on Beacon Hill? What makes a “best building” anyway? Tell us in the comments. *Mudede’s post says “Cleveland High School, which was designed by Mahlum Architects, won one of the AIA’s 2008 Honor Awards for Washington Architecture.” As far as we can tell, this is an error; the award they won in 2010 is for projects which were previously nominated for Honor Awards but did not win. The website design at the 2008 awards website is ambiguous so the error is understandable. Aerial photo of Cleveland High School in 2001, courtesy of Seattle Municipal Archives. The Cleveland High School PTSA invites everyone to help raise $10,000 by participating in the Cleveland High School Red and White Night Soaring Eagles Auction, Saturday, April 28, from 5:30-9 p.m. at Brockey Center on the South Seattle Community College Campus (6000 16th Ave. S.W.). You can be part of this fundraising event in several ways: by buying a ticket to attend, by donating an item for the silent or live auction, or by donating cash directly. To buy tickets or donate, go to this website and follow the steps there. Volunteers are also welcome. To volunteer, contact Heather Graves (hmchavez4@gmail.com). Cleveland High School on Beacon Hill is one of the schools that showed strong academic growth during the 2010-2011 school year, according to a report by Seattle Public Schools Interim Superintendent Dr. Susan Enfield. Seattle schools are ranked according to absolute performance scores and year‐to‐year growth scores on a 1-5 scale, with Level 1 being low and Level 5 being the highest level. Cleveland, which began a new Science Technology Engineering Mathematics (STEM) academy program last year, moved up from Level 2 to Level 3, and achieved a 218 percent increase in students meeting the math standard. Additionally, the school showed a small increase in enrollment in Fall 2010. At Cleveland High School, which moved up from Level 2 to Level 3, students have shown impressive academic growth after their first year of participation in both the Science, Technology, Engineering and Mathematics (STEM) program and the federal School Improvement Grant (SIG) program. Their success is illustrated by their performance on the statewide reading and math exams taken by students in grades 9 and 10: In reading, the percentage of students meeting standard increased by 6 percent from spring 2010 to 2011, rising from 63 percent to 69 percent; and in math, the school saw a 218 percent increase, as the number of students meeting standard increased from 17 percent to 54 percent. Since the state changed some parts of the state’s high school math test, it is impossible to fully compare Spring 2010 and Spring 2011 math results until Spring 2012, when the students will have taken the same test for a second year in a row. 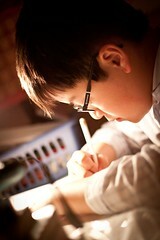 Even so, Cleveland students have made significant progress in just one year. Cleveland principal Princess Shareef said that faculty are working to increase the level of challenge in the coursework, as well as providing extra math instruction to students who are not yet meeting standards. Two other measures of successful high schools are enrollment counts and graduation rates. Cleveland’s enrollment had been declining for years, so one of the school’s goals has been to attract more students. Those efforts are paying off: in Fall 2009, Cleveland had 738 students enrolled; by Fall 2010, enrollment had increased to 795 students. Cleveland’s graduation rates are also showing progress: The school’s overall graduation rate jumped from 55 percent in Spring 2010 to 68% in Spring 2011. Shareef notes that staff focused on closing the gap in graduation rates between Anglo‐American students and students of color.